Even though Thanksgiving is a time for reflecting on the good things in our life and our gratitude for them, it can be hard to be contemplative when you’re worried about how you’re going to put together a great meal without breaking the bank. Thankfully, the solution actually isn’t nearly as complicated as you might think, either. By simply following our four tips below, you can stay within your budget without cutting corners on the quality or quantity of the Thanksgiving feast your friends and family deserve. The first step to saving money is to get the lay of the land and begin planning early. Call your family and friends to finalize your guest list so you have an accurate headcount of how many people will attending your dinner. Having a guest list will help ensure that you don’t overcook and spend money on food that could end up going to waste. Once you know how many people you’ll be feeding, you can begin planning your side dishes and what you’re going to cook beforehand to save time. Having the menu finalized well beforehand lets you create a shopping list of all the ingredients you’ll need. This means you can take an inventory of your pantry and avoid redundant purchases of ingredients you already have. It also means that you can watch out for coupons and sales on the ingredients you don’t have in the month leading up to Thanksgiving and get them at a lower price than you would at the last minute. This tip applies to both your decorations and side dishes. 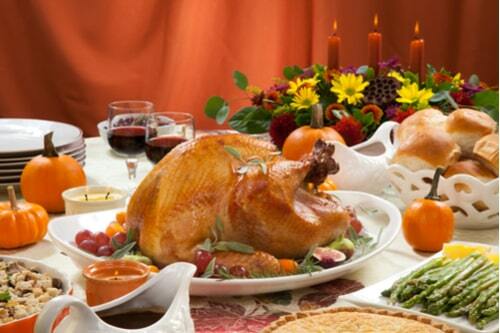 The stereotypical Pilgrim theme, (which is an inaccurate representation of the first Thanksgiving anyway,) may be a pleasant notion to some, but do you really decorative flatware, salt and pepper shakers, napkin holders, and other miscellaneous decorations cluttering your table and eating into your budget? 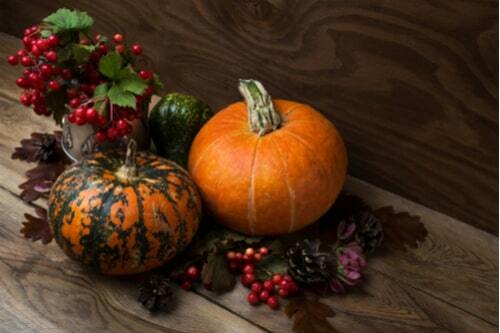 Instead of buying ornate table decorations, why not opt for simple ornaments like gourds, pumpkins, and acorns? All are pleasantly homey, seasonal and won’t cost an arm and a leg. 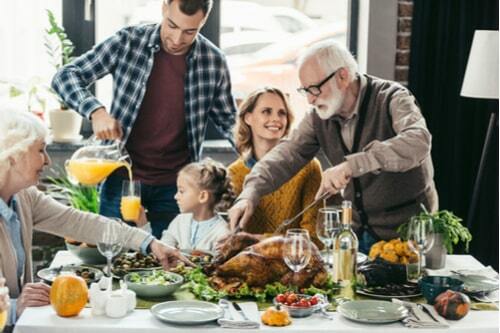 In terms of food, think about what your guests actually want to eat, and don’t feel obligated to make traditional Thanksgiving dishes no one actually wants to eat. No one in your family overly fond of sweet potatoes or green bean casserole? Just leave them off the menu. Cutting down on how many dishes you need to cook makes your life easier, and can greatly reduce the overall cost of your meal. At last we come to it, the crown jewel of every Thanksgiving feast. How the turkey came to define the Thanksgiving meal is anyone’s guess, but there’s no doubt the success of your dinner will depend on it. With all that said, it doesn’t mean that spending a fortune on your turkey is necessary, or will even guarantee a great meal. The first thing to know is that if you’re vigilant, you can actually get a turkey for relatively cheap leading up to the day of. Almost all grocery stores run promotions and sales on turkeys as a way of enticing customers to do their holiday shopping with them. Keep an eye out for coupons in the Sunday newspaper flyers or online that you can use to save big on your turkey purchase. If you’re out of luck and can’t find either a sale or coupon, another option if your budget is tight is to get a frozen turkey. They’re cheaper than fresh ones, and if you follow the directions and allow adequate time for it to defrost before cooking it, your frozen bird will taste just as good as a fresh one. If you find yourself in financial trouble around Thanksgiving or hit by unexpected expenses, don’t let it ruin your Thanksgiving. At Texas Car Title and Payday Loan Services, Inc. they are committed to helping people get the emergency cash they need. The car title loans they offer could help you deal with an unexpected expense, pay a stack of unpaid bills or even put Thanksgiving dinner on the table.